My son's friend is dead at 30 years old. Killed by a bullet that as my son put it: "wasn't meant for him". So much life left to live. Now so much pain, anger and disbelief. As a parent of a black child, teenager and young man you live in fear of this day. Well, this day is here for Justin's mom. I just don't understand. Do. Not. Understand. This was a young man with so much promise. This was a young man who read the newspaper EVERYDAY when he was in high school. Smart. Kind. Happy. Always smiling. This was a young man whose life was cut short and it doesn't make sense. How and when do I tell my son and his friends that they need Black Folders too??? Good Grief. 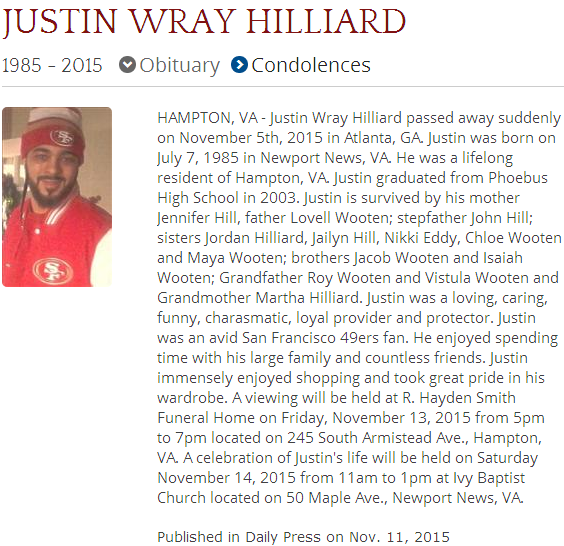 Rest in Peace Justin. Rest in Peace.